Botulinum toxin (Botox, onabotulinumtoxinA) is a material that has been known for over a century and used for medical purposes for more than 50 years. Botox initially was used to correct lazy eye (strabismus), blepharospasm (inability to move the eyelids in certain ways), and wry neck (cervical dystonia). In 2002, Botox was approved for improving and relaxing frown lines in the facial areas (the glabella) between the eyes on the forehead and has been used successfully in more than over 11 million patients. Dr Khan strives to inject just the right amount of botox to provide you with the lessening of wrinkles and lines on your face. Patients should know that Botox will not keep them from expressing themselves, but simply aid in reducing wrinkles and prevent facial grimaces and frowns that have become unintentional habit. 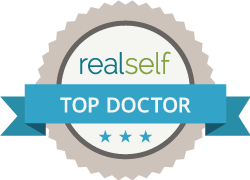 When implemented correctly, most people will not notice that a Botox procedure has been performed on you, but simply express to you that you look more rested and/or happier.